Many places in Gunma have started their winter illumination displays as the Christmas season approaches. 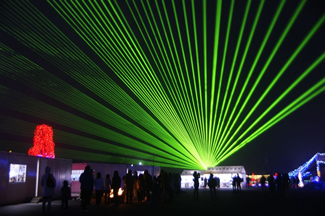 Each place has its own theme or purpose for their illumination display, especially this year. Some might say it is unnecessary to set up holiday light during such a trying time, but we believe that promoting local events such as illumination displays not only stimulates the local economy but also spreads holiday cheer to people affected both directly or indirectly by the March 11th disaster. Many places even upgraded their regular light bulbs to LED bulbs which are great for saving electricity. We hope you will enjoy the beautiful view of Gunma's winter wonderland. We appreciate your continuing support for trying to conserve electricity. Get bundled up and come out with us! It is absolutely gorgeous to see the illumination display by Lake Haruna. Although Lake Haruna is usually very quiet, it becomes packed with many visitors around this time. This year, they upgraded the number of light bulbs to 4,000,000 and they are also expecting the number of the visitors to increase. Each display has a different theme. You will see many different shapes! There will also be an "under water Christmas tree", a particulary unique display. Children who visit the site can look forward to receiving Christmas gifts from Santa. During this time, some of the rides will be open till 21:00. On the 25th of December, they will offer free tickets to a ride (not sure which one yet) in the park to show appreciation. It is time for the annual Maebashi International Exchange Party. Please come and enjoy the music, performances, and food from different countries. It is a great opportunity for you to meet people from all over the world. 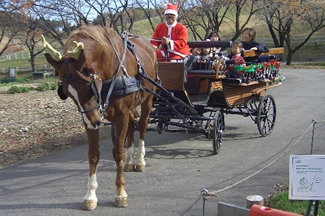 The Ikaho Green Bokujo will be decorated with Christmas ornaments! During this time, there will be Christmas events and the restaurants will offer a special Christmas menu. Also, strawberry picking will start around this time. Check and see their amazing English page as well. Enjoy shopping for fresh produce, traditional crafts and daily essentials at this event! Since this event is held at the end of December, traditionally people will be shopping and preparing for the New Year holiday in Japan. This market will be filled with flea markets and fun events. Come and see what a year-end busy street looks like in Japan! There will be food stalls from different countries on the Izumi Ryokudo. Izumi Ryokudo is known for its beautiful view and trees and flowers. 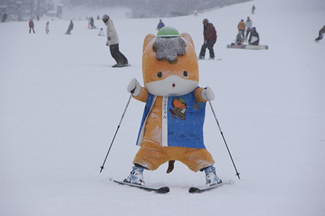 On the day of Ski Day, the Ski Resorts Management Association of Gunma will offer a ski and snowboarding classes for children. They hope to teach children how fun it is to do these winter sports. Apply by sending a postcard between November 1st, Tuesday and December 15th, Thursday. Mail the postcard with the information above to Gunma Ski Resorts Managers Association. The chosen participants will be notified via mail by December 23rd.